Flip phones went out of favour even among non-business users when touchscreen smartphones arrived. However, it seems Samsung is inclined give these handsets a second chance with its allegedly upcoming Android-powered Galaxy Folder smartphone. The phone had been leaked previously but dismissed from most quarters as an abandoned prototype. However, a recently leaked photo and accompanied specifications suggest that the South Korean manufacturer is still actively developing this handset. 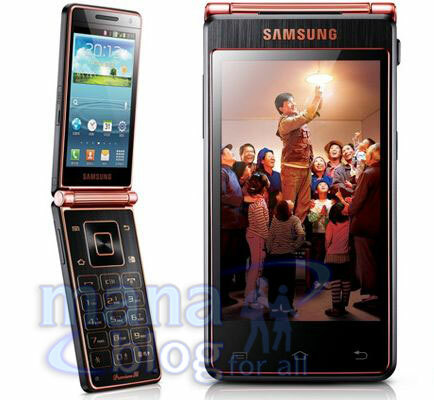 According to a report by tech website GSMInsider, the upcoming Android-running flip phone by Samsung will be sold by the name Galaxy Golden, though it is being developed under the codename Galaxy Folder. It will feature two touchscreens, one on the front and the other on the back of the top panel, while the alphanumeric keypad will reside below it. The two AMOLEDtouchscreens of the phone will measure 3.67-inch in size and have resolution of 800x480p. The handset is rumoured to run on Android 4.1 (Jelly Bean) operating system and pack a 1.7GHz quad-core Snapdragon 400 processor under the hood, backed by 2GB RAM. It is also said to have two cameras and 4G connectivity. Rumours say that the Galaxy Golden will initially be marketed only in South Korea and may hit other countries with the same name later.